biker_ev wrote: Yeah, 3.x seconds at 300+ mph is boring as hell! As a spectator, in which it's looked the same for decades now, indeed, yes it is. roon wrote: If they were any longer they would begin to resemble F1 cars. Top Fuel is pretty much a technologically stunted form of motorsport... for safety reasons. What they should do it ditch the nitromethane nonsense, mandate pump gas, and open up the rulebook on just about everything, and let them work their way back up to the current speeds through different tech. Vacuum traction would be awesome to see in drag racing, maybe six drive wheels. It's just --- boring the way it is right now. Brian, You didn't mention that you have to anticipate what happens when you put out a cylinder. As it is if you lose even one it starts pushing you toward the wall. What happens when you are depending on it for downforce or traction? The only problem I have with modern NHRA T/F is that they need to go back to 1320ft. The ETs and MPH mentioned here are accurate and are achieved in 1,000 feet, not 1320. Strips were shortened to try to reduce speeds. Didn't work. NHRA (Nat Hot Rod Assoc) is very safety conscious (or maybe it's just PR). Years ago, a very technically advanced drag racer named Pete Robinson ("Sneaky Pete") experimented with ground effects on his fueler. It killed him. I dislike the current NHRA setup, which is basically a traveling circus of a small group of racers (small because of the very high co$t of racing at the top level). The NHRA would have you believe, for example, that only the 16 fastest cars in each premier group qualify. In fact, sometime LESS than 16 cars even show up -- again, too expensive. Next week I am traveling to Bakersfield, California for the "March Meet." Every year since 1959, drag racers from around the USA travel to this meet. Not 16, but often 20-30 cars show up in each class, including some very wild ones that the NHRA will not sanction (imagine, if you can, a 10K HP hemi fuel engine in a 90-100 inch wheelbase fiberglass-bodied Model T) . Further, "nostalgia drag races," featuring retro cars, such as front-engined fuelers are growing at a very refreshing rate. Hope this adds something to this thread, BTW, I worked as a "gopher" on a top fuel dragster back in the late 1960's. It was more fun then; a few guys with $3k or $4k could qualify at a national meet. We did. I hope some of you with much more aero knowledge than me will consider the aero effect of the rear tires growing several inches taller at top speed than at rest (and, of course, narrower). Also consider that the overall aero of a top fueler is horrible, but it took several years for the aero advantage of the fully enclosed body to exceed its weight disadvantage. Finally, off topic (mea culpa) but I hope some of you with a strong mech engineering background will consider that top fuelers (and cars in several other top classes) spin their tires throughout the 1000 feet. "Tire shake" is the bete noire of top drag racers. Ironically, it is caused by the tires spinning too much -- or too little. Another factoid: top fuelers use two sets of injectors, one above and one below the supercharger. I don't. I come by it every five years or so, give-or-take. Squint a little. Shrug. "Same sh1t" and change the channel. ??? I saw no backfire. What I saw was how few power strokes actually take place. They may snap to 8000 rpm but how many revolutions take place in a little over three seconds. VARIANT , I take it you didn't watch Phoenix. If you do not watch, how can you comment with such a strong opinion? strad wrote: Brian, You didn't mention that you have to anticipate what happens when you put out a cylinder. Agree, top fuel should use the 1/4 distance. Nowadays it is too similar in performance with funny cars, which is a shame. Grabbed this from Phoenix first round. Exhaust thrust: This is a very live topic in fuel racing at the moment, the key is to get the right balance between thrust off the line and downforce, which is influence by the header 'lay down' angle. I believe the thrust is of the order of 1000 lbs. Pointing straight back that gives the car an extra 1000 lbs of accelerating thrust. Pointing straight up (and assuming unlimited power and a coefficient of friction of 3) gives the car an extra 3000 lbs of thrust. Somewhere in between (close to vertical) is optimum but this changes further down the track as the car becomes less traction limited. How did you come up with 1000lbs? Apologies for reviving the long-dead-thread. I'm an avid fan of Top Fuel racing and have been thinking about ways to improve the cars. Like the thread starter I went and found a rules package and most of what I had in mind survived. That said, as others have mentioned, the NHRA can and does swing the ban-hammer if they think something is a safety risk, or if they feel it will start a spending war. "lenticular disc" front wheels: These are sorta like the classic 'Moon' discs, but actually stick out proud of the tire, and are curved. These have rocked the cycling world. Also fixing something aero this far up the food chain has to have benefits down the line. 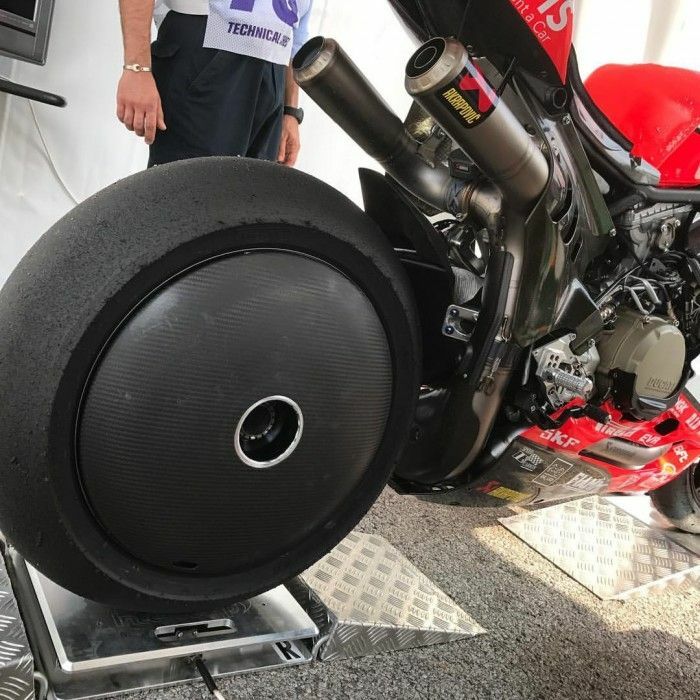 See World Superbike experiment, below. Everyone is running the hinged tail-ligt flaps to get high pressure air out fromn under the body. The flaps are regulated by the NHRA, but the lead-in inside the body is never mentioned. Like with the injector, above, getting some radiused 3D geometry on the intake side of those opening should increase airflow by 30% or more. FWIW, even though I know everything is tightly controlled, I really enjoy the show. My brain still has a hard time comprehending what these fuel cars can do. Last time I went I ended up talking with Greg Anderson about his cars unique front suspension without even realizing who he was (I didn't follow Pro Stock at the time.)... I can't see that ever happening at an F1 race! Some interesting things to think about. I think, just my opinion, that mostly they think they have more than enough power and that the problem is trying to control what they have. I don't know anything about those wheels but if they work it seems like it would be free MPH.